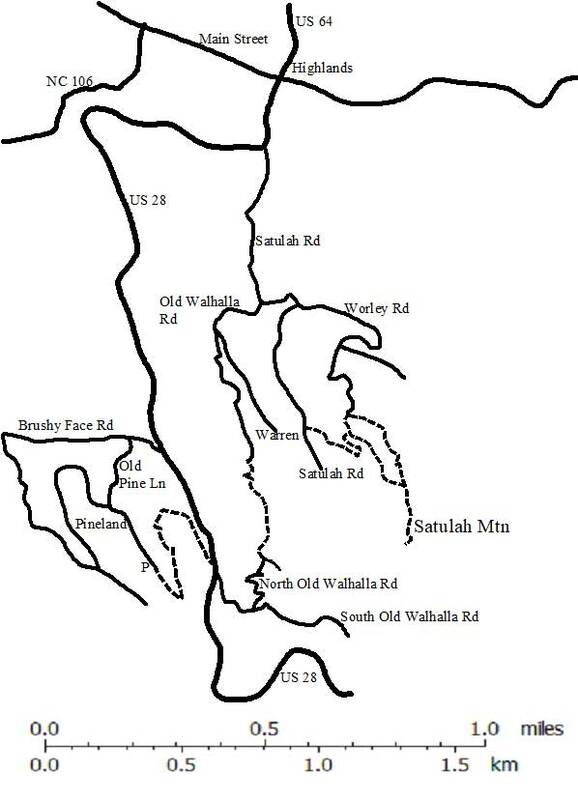 The Satulah Mountain Trails are a moderate to difficult hike along a mixture of paved roads, an old rocky roadbed and footpaths to a peak of 4543 ft. just south of Highlands. There is a 270º view to the south, east, and west. Views of the Piedmont, Blue Valley, and Rabun Bald are excellent. The roads on this hike are privately owned. The upper portion or Worley Road is open to residents and hikers (foot traffic) only. Highlands: This trail climbs steadily for 1.6 miles gaining 700 feet in altitude. Park your vehicle in downtown Highlands. From downtown Highlands, take highway 28 south toward Walhalla for 0.2 miles until the road makes a sharp curve to the right. Go straight ahead at the curve onto Satulah Road. Half a mile up the road the road forks, continue straight ahead on Worley Road. Follow Worley Road to the turnaround at the end of the road, a distance of about 0.4 miles. The trail to Satulah Mountain is the rocky old roadbed to the right or the footpath to the left. Follow the old roadbed to the right an additional half a mile to the clearing at the top of the mountain. Brushy Face Preserve: This 2.7 mile trail begins in the Brushy Face Preserve then crosses US 28 after which it climbs steadily for 2 miles to Satulah Mountain. From downtown Highlands drive south on US 28 for 1.5 miles and turn right onto Brushy Face Road. Drive a tenth of a mile and turn left onto Old Pine Lane. Drive two-tenths of a mile and turn left onto Pineland Drive. Drive to the trailhead at the end of the road. There is no designated parking, park on the shoulder of the road being careful not to block the road. Follow the trail through the Brushy Face Preserve for six tenths of a mile to US 28. The hike continues to the right and across the road on South Old Walhalla Road. Walk down South Old Walhalla Road for a tenth of a mile and turn left onto North Old Walhalla Road. Walk up North Old Walhalla Road to the point where a paved driveway turns right and goes uphill. Continue straight ahead on the old roadbed, look for a Land Trust boundary marker on the left. In just over a tenth of a mile the old roadbed intersects Old Walhalla Road. Walk up Old Walhalla Road to Satulah Road. Turn right on Satulah Road and walk up hill for to where Satulah Road turns right and Worley Road continue straight. Continue straight ahead on Worley Road. Follow Worley Road to the turnaround at the end of the road. To reach the summit, continue on the old roadbed to the right or the footpath to the left. The footpath intersect the old roadbed before reaching the summit.